Chemical storage room designs are crucial for proper, safe storage. 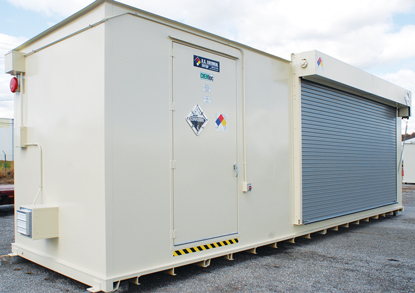 A proper chemical storage room meets compliance with government regulation at the federal, state, and local level, and creates a safe environment within your facility. Your chemical storage room is a critical factor if you regularly handle and process chemicals. We can help you ensure total compliance. A customized chemical storage room is the safest route when shopping for chemical storage solutions. Customizing your chemical storage room allows you to equip the area with crucial accessories that can mitigate chemical hazards. At U.S. Chemical Storage, you’re able customize your chemical storage room with such accessories as mechanical ventilation, climate control, spill detection, personal safety, and much, much more. Your chemical storage room will be equipped with spill containment for increased protection so no leaked or spilled materials can escape into the environment. This is important for maintaining compliant chemical storage and protecting the environment. Your chemical storage room should be durable, in order to ensure years of compliant storage. Reliability is a guarantee at U.S. Chemical Storage, and there are a number of other ways that you, the customer, can maintain a safe, compliant chemical storage room. Your chemical storage area should be well-maintained to ensure that all chemical storage regulations are met. This includes good housekeeping practices, segregating incompatible materials, and heeding all warning signs. Flammable storage, for instance, should not be stored alongside oxidizers, as this increases the chances of a fire hazard. Electrical systems may require maintenance as the years go by to ensure proper functionality and safety. Practice common sense and report all qualifying materials to the government and your chemical storage room will be a safe, compliant area within your facility. As always, U.S. Chemical Storage is dedicated to helping you through your chemical storage process by providing compliant, approved construction. It is our passion to help protect the environment and community through our fully customizable chemical storage room selections.